A copy of Oda Nobunaga’s portrait by the Italia painter Giovanni Nicolao, probably commissioned by Nobunaga himself. Oda Nobunaga is the son of Oda Nobuhide one of the daymio from the Owari province. When his father died in 1551, he started to go completely crazy taking the distance from the Oda clan allies, preferring his brother Nobuyuki. Even if he was Nobuhide’s heir, he wasn’t sure to be able to succede him. The Oda clan was subject to Kanrei Shiba Yoshimune, head of this clan was Nobunaga’s uncle, Nobutomo. Even Nobutomo had Yoshimune killed when he tried to help Nobunaga. Despite that, he managed to get help from another uncle, Nobumitsu up till he conquered the castle of Kiyosu. Here Nobutomo was killed and Nobunaga lived here for the next 10 years. Oda Nobunaga also, thanks to the alliance with the Imagawa clan and the Kira clan, was able to move his army in the Mino province (1555). All this to help Saitō Dōsan. However, ths campaign proved to be a failure because Dōsan was defeated in 1556 and Yoshihatsu took his place. A few months later, Nobuyuki, Shibata and Hayashi Katsuie Hidesada, challenged Nobunaga to control the Oda clan, but lost. However, they were forgiven thanks to Nobunaga’s mother who interceded on their behalf. Nevertheless, Nobunaga continued to be suspicious of Nobuyuki, much to pretend to be sick to invite him to his castle in Kyiosu and assassinate him in 1557. In 1559 Nobunaga had defeated all kinds of internal opposition to the clan becoming Lord of Owari. For a while he has continued to enter into alliances with other damiyō thanks to Kanrei Shiba Yoshikane. However when he found them to be in talks with Kira and Imagawa in an attempt to attack the Oda clan, he went to war. In 1560 Nobunaga faced the great army of Imagawa Yoshimoto. This army was formed by a number of men who oscillated between 20,000 and 40,000 men. Although he was marching towards Kyoto, with his small army of 2000 men, he played it smart. In the famous battle of Okehazawa, he took advantage of a violent and sudden storm to attack the camp of Imagawa and kill Yoshimoto, surprising the whole country for the lightning victory. Since that time, the name of Oda Nobunaga was famous throughout Japan and the Matsudaira clan signed an alliance with him. Saitō Yoshitatsu of the Mino province, died in 1561 and was succeeded by his son Tatsuoki. However, he was too young and inexperienced to win the confidence of his vassals. Nobunaga obviously took advantage of the situation and moved his castle in Komaki to attack Mino. Then he convinced the vassals to leave their incompetent and inexperienced Lord. In 1567, Oda Nobunaga was able to take possession of the castle and to exile Inabayama Tatsuoki. Nobunaga moved into his new castle, renaming it Gifu. The word Gifu came from Mount Gi, from which the conquest of China set off by the Zhou Dynasty and Tenka Fubu. 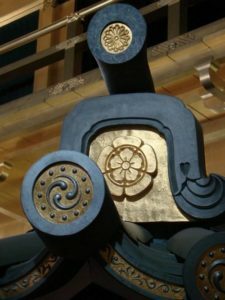 With this he also forged a seal, which means “one military sign under the sky”, this was a way of saying that he would like all of Japan under one sword and fill Japan with military glory. In 1564, Nobunaga gave his sister Oichi in marriage to Azai Nagasama, securing the support of the Azai clan. In 1568, Ashikaga Yoshiaki, brother of Yoshiteru, went to Gifu to ask for Nobunaga’s military aid to oust the shogun Yoshihide. Nobunaga agreed to get one shogun to legitimize their military campaigns and at the same time being in control of the capital Kyoto. Nobunaga conquered all the castles of Rokkaku. Yoshiaki became shogun and offered Kanrei’s place to Nobunaga, but he refused. As soon as Yoshiaki realized he was manipulated by Nobunaga, he began to plot against him seeking allies willing to fight. Thanks to the alliance with the Asakura clan, Yoshiaki entered a conflict with the Oda clan and even managed to afflict them heavy losses. In the battle of Anegawa, Nobunaga defeated the armies of the Azai and Asakura clans. In 1571 he attacked the Buddhist monastery of the Tendai Enryaku-ji school. At this point he attacked the Nagashima fortress, killing thousands of people. Despite being in a good relationship with the Oda clan, the Takeda Shingen Takeda clan joined the alliance against Nobunaga. In 1572 he marched to the capital, but died in 1573 before reaching it so Nobunaga defeated Yoshiaki and exiled him ending the Ashikaga shogunate. In the same year the Azai and Asakura clans were finally defeated, and his brother-Azai Nagamasa, after giving back his sister Oichi, performed seppuku. The heir of Shingen Takeda Katsuyori, was defeated in 1575 in the Battle of Nagashino. Here the Oda-Tokugawa faction used for the first time the muskets purchased from the Portuguese. The army of Takeda was mowed before reaching the melee clash. Continuing his expansion, Oda Nobunaga began to dislocate his generals in control of individual provinces. Shibata Katsuie and Maeda Toshiie were sent to the north and Akechi Mitsuhide to the Tamba province. Hashiba Hideyoshi was instead sent to the West in 1577 against the Mori clan. The latter was sustaining with supplies by sea the Ikko fortress of Ishiyama Honganji. Here Nobunaga’s army ran the siege for some time from the ground. 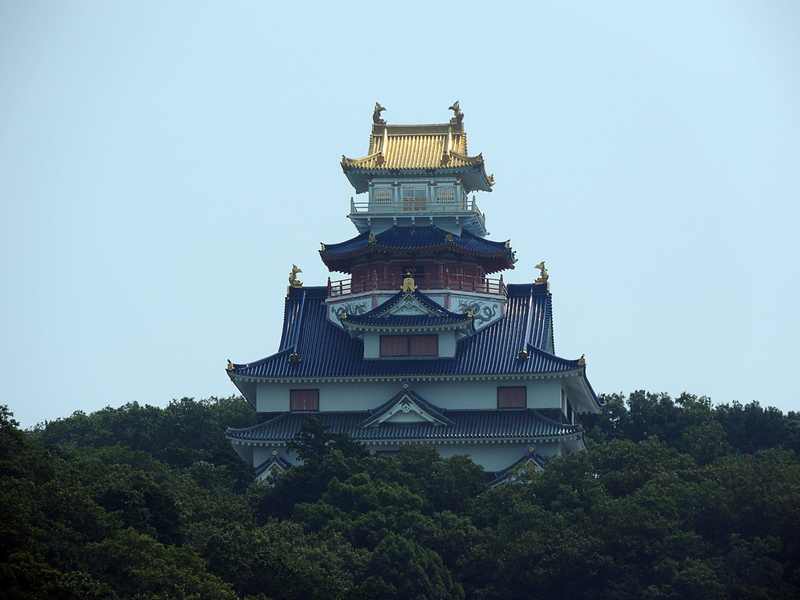 In 1578, the new Nobunaga’s castle was completed, known as the castle of Azuchi. Impressive for its extravagant decorations, the period between the fall of the Ashikaga shogunate and the death of Nobunaga was named from this castle. This is now known as Azuchi period. In 1577, however, Uesugi Kenshin, the second best general of his time after Takeda Shingen, decided to take part in a second anti-Nobunaga alliance. The first encounter took place at the Battle of Tedorigawa, resulting in a decisive victory for Kenshin. Uesugi then began to prepare his march on Kyoto. According to one tradition, Nobunaga allegedly confessed to one of his officers that if Kenshin had come to Kyoto with his army, he would have no choice but to surrender and hope to be spared. Uesugi Kenshin, however, died, possibly of a heart attack, or perhaps stomach cancer, while he was in his wash house. According to sources of the time, his health seemed compromised since some time. Without no good rivals, Nobunaga forced the last Ikko rebels to surrender in the fortress of Ishiyama Honganji in 1580. This completely destroyed the Takeda clan in 1582, during the Battle of Temmokuzan. Nobunaga was now the undisputed authority in the country, and was preparing to move his armies against the provinces of Echigo, and Shikoku. Japan in 1582. The purple areas indicate the territories controlled by Oda Nobunaga in 1560, and the gray areas indicate the territories controlled by Oda Nobunaga until his death, in 1582. In 1582, Hashiba Hideyoshi, one of the generals closest to Nobunaga, invaded the province of Bitchu, besieging the castle Takamatsu. The latter was vital to the Mori clan, because it occupied a strategic position from which it was easy to penetrate into their domain. Mori Terumoto arrived with his army in support of Takamatsu Castle. The two sides found themselves in a stalemate. At this point, Hideyoshi asked reinforcements to Nobunaga. It was noted that Hideyoshi didn’t really need reinforcements. However, he still asked the help of his Lord. According to some, he did it not to directly take credit for the victory, because many generals do not take kindly to the success of a general of humble origin and not part of a samurai clan. According to others, Hideyoshi intended to put Nobunaga in a critical position so to be able to take a personal advantage. In any case, Nobunaga left the preparations for the invasion of Shikoku to Niwa Nagahide and went with Akechi Mitsuhide to reach Hideyoshi. Along the way, Nobunaga and his men paused in Honnō-ji temple in Kyoto. Here Nobunaga, being at the center of his rule and considering himself safe, was guarded only from a few trusted servants and guards. Unexpectedly, Mitsuhide Akechi ordered his men around the temple in an attempted coup. In the skirmish that followed, Nobunaga lost and retreated inside the temple and Mitsuhide, applying the technique that Nobunaga had so often used, set fire to the temple. It is not known what happened to Nobunaga in his last hours of life. Probably he and his attendant Mori Ranmaru accomplished seppuku while the temple was burning. His remains were never found in the rubble of the temple, giving rise to a wide range of popular legends. Immediately after the coup, Mitsuhide’s men attacked the Nijo Castle, where they forced Nobunaga’s heir, Nobutada, to perform seppuku in return. Nobunaga never accepted any of the titles that were offered. He remained only the head of the clan Oda and the daimyo of Owari. Nevertheless, his authority allowed him to introduce major changes in the country. One of the most important news of the Azuchi-Momoyama period was the creation of samurai families. In the Muromachi period in fact the many wars had led the clans to accept in their armies anyone skilled in combat. During the Sengoku era basically every male Japanese adult belonged to at least one military organisation. From 1576 Nobunaga began to confiscate weapons to peasants in the territories he controlled. In this way he reduced the risk of riots and the number of fighters from him not directly controllable. His successor Toyotomi Hideyoshi, despite being originally from a family of farmers, completed the work. He recognized by law the samurai caste. Access to this caste could thus take place only by inheritance by banning all non-samurai to carry firearms. Samurai families who had opposed Nobunaga first, and then Hideyoshi and Ieyasu, were declared illegitimate. Their components became rōnin or civilians. On the military level, Nobunaga led his army to the technological level of the European ones. He took the first large-scale spears, firearms, armored ships, and fortifications worth of the period of mass wars. Some sources also attribute to him the creation of the multi-line formation of the troops equipped with muskets. In this way he was able to ensure continuous focus and therefore a greater impact on the enemy. This tactic, used for the first time in 1575 during the Battle of Nagashino, would in fact appeared in Europe only in 1590. Nobunaga made the first extensive use of European weapons for its military campaign. He brought a radical change to the antiquated military tactics employed by Japanese armies. His wars, however, are remembered primarily for their violence and ruthlessness. To this we can add the practice of burning enemies alive, that Nobunaga used as a warning to his opponents. Oda Nobunaga focused on the specialization and professionalization of his army. He gave assignments and promotions based strictly on merit, almost completely ignoring the rules of nobility and family relationships. The rise of Hideyoshi is a prime example of this. The defeated daimyō expropriated lands then redistributed them among his vassals not based on size, but on the production of rice. 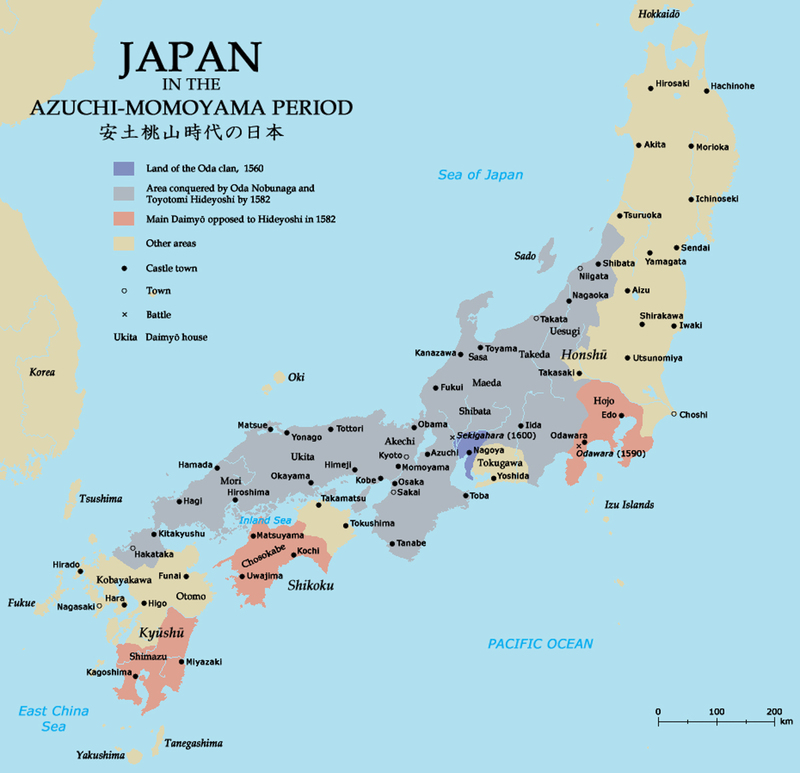 With some modifications, Oda Nobunaga’s organizational system was extended to the entire country with the beginning of the Tokugawa shogunate. Economically, Oda Nobunaga showed great competence, building castles as focal pin for the economy. In this way he favored the migration from an agricultural economy to a manufacturing type. He built roads between the castles, to facilitate commercial traffic and the movement of armies. He conformed the units. He enhanced the international traffic, with China and Korea also with Nanban (“southern barbarians”, a term that covers the Philippines, Siam, and Indonesia, but also Europe). 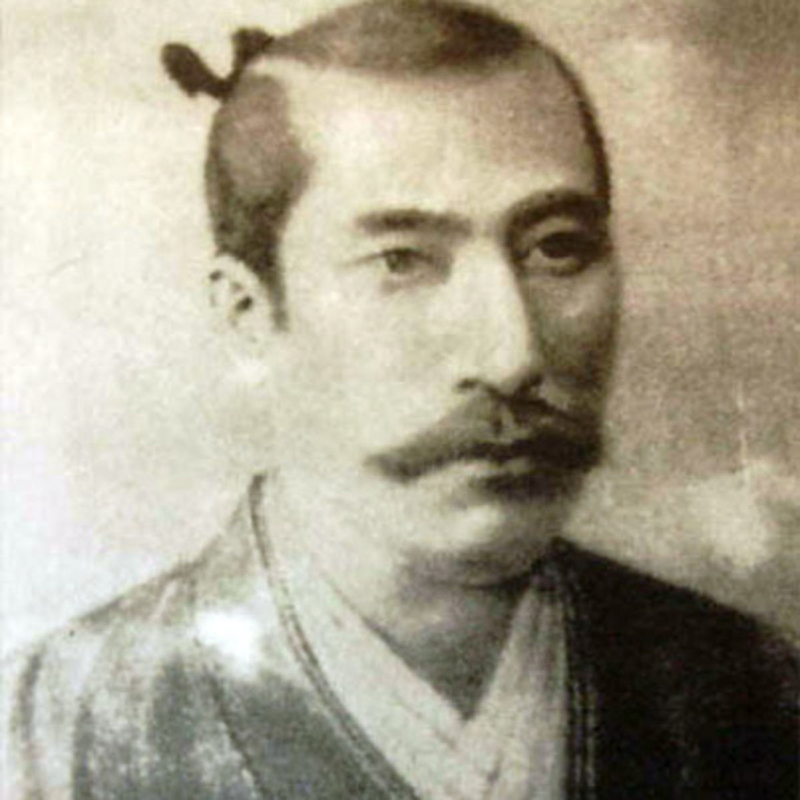 Moreover, he established the Rakuichi Rakuza, to encourage the opening of unions, associations and guilds, prohibiting monopolies that Nobunaga considered an impediment to trade and he also developed laws requiring cases of tax exemption and regulated the contraction of debts. Thanks to the wealth accumulated over time, Oda Nobunaga financed various forms of art, and built beautiful gardens and castles. His castle of Azuchi on the shores of Lake Biwa is described by contemporaries as one of the best in history. 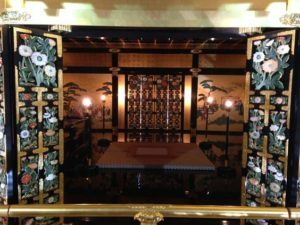 Covered with gold and statues on the outside and decorated inside with screens, sliding doors, paintings on the walls and ceilings, especially by Kano Eitoku. In this period, Oda Nobunaga’s master of ceremonies, Sen no Rikyu codified the rules of cha no yu, the tea ceremony. Nobunaga made this ceremony very popular and used it to discuss politics and business. Under his rule the first examples of kabuki also appeared, developing more organically in the more peaceful Edo period. Nobunaga was very interested in European culture, so much so that he collected works of art, arms and armor from the west of the world. It is considered one of the first Japanese to be wearing European clothes. Although not religious, he supported the Jesuit missionaries in Japan as a political move against Buddhist monks. Under his rule, on August 15 1576, it was built the first Christian church in Japan. According to the sources Oda Nobunaga and the entire Oda clan were descendants of both Fujiwara and Taira clans. His ancestry can be directly traced back to his great-great-grandfather Oda Hisanaga, followed by Oda Toshisada, Nobusada Oda, Oda Nobuhide, and Nobunaga himself. Nobunaga appears frequently in the narrative and continues to be described in many anime, manga, video games and movies. It is generally described as evil nature or even demonic, although some of the works depict him in a more positive light. This type of work includes the films of Akira Kurosawa Kagemusha – The Shadow Warrior. Here the character of Nobunaga is energetic, athletic and respectful of his enemies. In Goemon he is described as a master of Ishikawa Goemon. Nobunaga is also a protagonist of the historical story Taiko Ki Eiji Yoshikawa, here is a firm but benevolent lord. It is described in a heroic manner even in some video games as Kessen III, Ninja Gaiden 2 and the Warriors Orochi series. In one of the Hunter × Hunter Ghost Brigade members is a samurai named Nobunaga Hazama. In contrast in the series of novels and anime Yōtōden, he is described literally as a demon and a lord of warhungry for conquest. In the novel The Samurai’s Tale by Erik Christian Haugaard, he is an antagonist “known for his merciless cruelty.” It is described as evil or megalomaniac in some manga and anime series including Samurai Deeper Kyo and Flame of Recca. 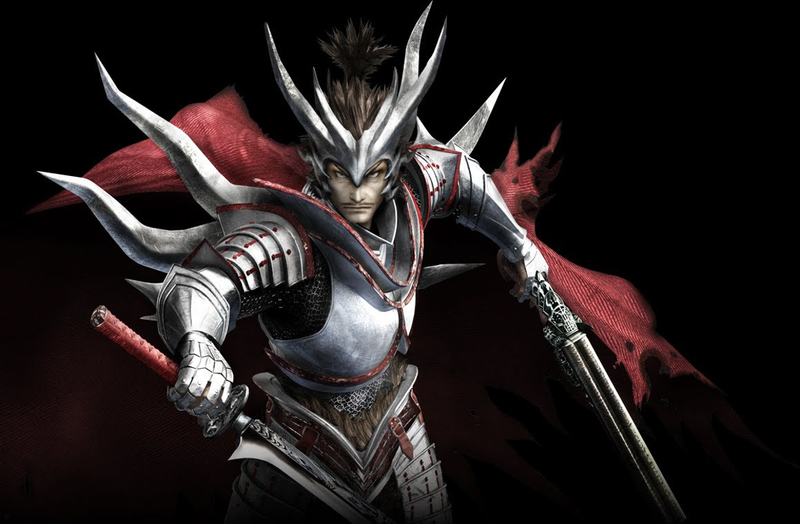 Nobunaga is described as evil, bloodthirsty, and / or demonic in many video games such as Ninja Master’s, Sengoku, Inindo: Way of the Ninja and Atlantica Online, and the game series of Onimusha, Samurai Warriors, Sengoku Basara (and its adaptation as anime) and Soulcalibur. It is also mentioned in Detective Conan in an Osaka case (283-285 episode of the anime). There are also numerous examples of his descriptions in a more neutral or historical context. These are found especially in the taiga drama (fictional series) on Japanese television. Oda Nobunaga also appears in the manga series Tail of the Moon, Kacchu no Senshi Gamu and in the historical novel by Tsuji Kunio The Lord Shogun of the Warring States. Historical representations in video games (mostly in Western strategic games) include Shogun: Total War, Total War: Shogun 2, Throne of Darkness, “dominations”, Ninja Commando and the series Nobunaga’s Ambition, like Civilization V and Age of Empires II: The Conquerors and Sengoku Basara. 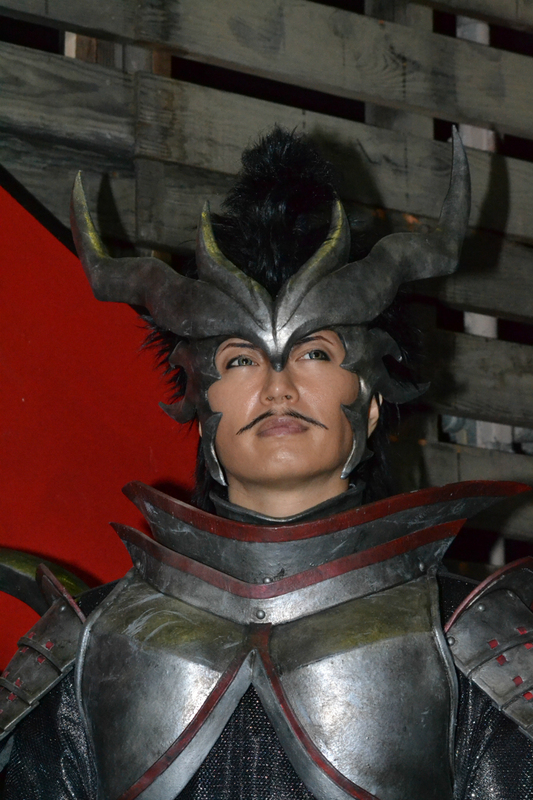 Oda Nobunaga was also played by the Japanese singer and actor GACKT in live action Sengoku Basara -Moonlight Party- taken from the video game Sengoku Basara, which aired in 2012.